"Gyumri is the Capital of Humor," reads a posted sign on a brick wall on a side street in Gyumri, Armenia's second largest city. The sign is spot on about this city's humor industry and valiant mindset, which throughout its centuries-old history has boldly challenged authorities with most intellectual breed of humor that's become the signature of its boisterous, outspoken inhabitants who even during the height of the restrictive Soviet power humored the authorities. In fact some of the city's most well known heroes are humorists - like the famed "Poloz Moukuch" whose name adorns a small tavern in the old section of the city. Set on the northwestern tip of Armenia, Gyumri is less than 10 kilometers from the Turkish border, a few hours drive from the Republic of Georgia, and nearly two hours from Armenia's capital city, Yerevan. The sprawling city's history dates back to the third millennium BC and its geo-political significance at the crossroads of east and west has for centuries positioned it a hub for commerce, attracting affluent merchants from neighboring countries. Throughout its tumultuous history, Gyumri has maintained its highly regarded reputation for commerce, education, arts and the sciences. At its glory days, more than 30 manufacturing firms including a textile factory and other master trades distinguished the city's financial might in the region. Occupied and ruled by the Byzantines, Seljuks, Persians, Ottomans, Russians and the Soviets who set, and still maintain military bases here - Gyumri has metamorphosed from Kumayri, to Alexandropol (1837-1924) the third largest trade and cultural center in Transcaucasia, to Leninakan during the Soviet era (1924-1990) and Gyumri since early 1990's with Armenia's independence. There is an undeniably distinct Armenian spirit of resilience, pride, and a gallant humor that's unique here. There's an unconfirmed story about how during the Soviet era a group of Gyumri men had circled the city square carrying a black coffin on their shoulders. When folks had inquired about the identity of the deceased, the men had opened the top of the coffin to reveal copies of the Soviet daily newspaper Pravda "truth" in Russian. Today's Gyumri is still reviving from the catastrophic 1988 earthquake, which destroyed 80 percent of the city's infrastructure and buildings, left 50,000 homeless, more than 25,000 dead and countless others fleeing the city for better opportunities abroad. While millions of dollars of relief aid poured into Armenia earmarked for the earthquake zone reconstruction, local and government officials went from rags to riches, while vast majority of citizens were deprived of the relief aid. The 200,000 plus population has now shrunk to around 120,000. Thousands of residents still live in makeshift metal containers - known as Domigs - which were brought in after the earthquake as temporary shelters for the homeless. Gone are the city's major industries, including the textile plant that employed nearly 10,000 local residents. Now 28 years later remnants of the earthquake are still evident amidst newly built structures, which don't preserve Gyumri's unique architectural style, but are mere patch-ups. Traces of Gyumri's thriving past glory is tucked away in the old Kumayri part of town where a maze of cobblestone streets with some standing magnificent 18th and 19th century "belle epoch" architectural structures stand resolute in orange and black touf. Courtyards hugging wooden, hanging balconies, and elaborate cornices reflect an era when residents took pride in constructing exquisitely accented homes with front doors which today stand dilapidated with traces of their original handcrafted façade. Some of the former homes of affluent merchants are now house-museums like the Aslamazyan Sisters Gallery, which since 1987 has showcased more than 600 original paintings, graphics and ceramics by the trailblazing Aslamazyan sisters who traveled to more than 60 countries, unprecedented under the Soviet rule. Their paintings reflect images and scenes spanning from Europe to Africa to East Indies. The two-story museum is outlined with wooden balconies and railings that overshadow a tree-laden courtyard. The poet Hovhanness Shiraz's house-museum, in black and orange touf, has been operating since 2003. A personal tour by the poet's great niece reveals nuggets of less known details about the non-conformist poet who endured the hardships of the Armenian Genocide, was banished to an orphanage and later reunited with his mother and sister to live an impoverished life. Shiraz became a national icon whose ultimate devotion to preserving his Armenian national identity, not the Communist party, banned his travels abroad. His poetry reached the likes of John Steinbeck who visited the poet in 1963. Besides some very basic personal items including the poets bed with his mother's photograph and his writing desk with a dried bouquet of crocuses which he had a habit of sending to friends to welcome Spring - the museum retains the original script of Shiraz's 1941, 8000-line monumental poem, Armenia Dantesque, which details the horrors of the Armenian Genocide - a topic banned under the Soviet rule. Having never been to western Armenia, Shiraz's descriptions of the atrocities of the Armenian Genocide challenge Dante's descriptions of hell. While portions of the poem were published during his lifetime, the poem in its entirety was published in 1990 after the poet's death in 1984. Another such museum is the National Architecture and Urban Life, preserving Gyumri's splendid past with city replicas, sampling of multitude of trades, and prosperity of its opulent middle-class family life enjoyed in the 1800's Alexandropol. The museum honors notable public figures who called Gyumri home. There is even a wedding reception invitation from early 1900's, which competes with the finest modern day invitations - both in script and elegance of paper design. In 2013, Gyumri's mastery in the arts and crafts established it as the "cultural capital" of the Commonwealth of Independent States (CIS). The love for the arts is clearly evident throughout the streets, parks and rotaries adorned with statues of poets, writers, musicians, painters, actors, politicians and historic Armenian heroes and freedom fighters. As the city of pedagogy, Gyumri boasts 47 public schools and colleges, 23 kindergartens, eight art and music schools, and the oldest Southern Caucasus art (painting) school built in 1921. The city's proud legacy in sports is reflected in its 20 sports schools - and residents are not shy in reminding visitors that their city's athletes won four Olympic and 26 world and European championships and set 52 world records. Best panoramic view of Gyumri and its environs from Mother Armenia monument and park. On a clear day there are great views of the Aragast mountain chains that hug the city - and make it the "Siberia" of Armenia during winter months when temperatures can drop in double digits below zero. The massive, circular Black Fortress, erected by the Russians in 1830's to ward off the Turks during the Russo-Turkish war, is currently under renovation. But there's a new layer of life developing in Gyumri - dusting off the proud legacy of the city, and rebuilding the city's modern day advances. Life goes on in Gyumri as it has throughout its centuries of upheavals and natural disasters. At the Vartanantz Square a rectangular fountain pool sits across the sprawling newly constructed city hall building, flanked by two 19th century cathedrals -- Holy Mother of God and the Holy Savior which is still under construction from the 1988 earthquake damage. A colossal statue rising by the fountain pool is of the Armenian heroic military leader, Vartan Mamigonian saddled on his horse armed with a cross and a sword leading the Armenians against the Persian Empire to uphold his nation's Christian religion. Below him stand statues of Vartan's mother, spiritual leaders and rulers of the time testimony to Armenia's turbulent history of occupations, victories, religious and territorial wars which continue to this day with the war in the neighboring Republic of Azerbaijan over the disputed territory of Nagorno-Karabakh (Artsakh) which reignited this April. The newly built Gyumri Technology Center (GTC) - a joint endeavor between the Armenian government, Enterprise Incubator Foundation and the World Bank, inaugurated in 2014 hopes to turn Gyumri into a regional and international center for technology, training and development. In addition to tech start-ups, the building also houses the new buzz in town, the Tumo Center for Creative Technologies a free after school program, opened in partnership with AGBU. Opened last year, Tumo Gyumri already has 1,500 youth, between the ages of 12-18 enrolled in its state-of-the-art technology and design classes, and wide range of tech workshops taught by both local and international workshop leaders. Across the GTC building, in Gyumri's Central Park, stands the dilapidated façade of the first and oldest majestic theatre where once affluent Alexandropol residents attended world premieres of plays and operas by local playwrights. Soon traces of the theatre's 19th century glory will be polished and restored and woven into modern architecture as the theater will become the new home of Tumo x AGBU Center for Creative Technologies. The youth here have inherited the distinct character - both in humor and resilience. They are proudly committed to contributing to their city's progress through higher education. A group of Tumo students gather on a Saturday afternoon at the Vartanantz Square listening to fellow student, Gohar Grigoryan, strumming her guitar to a song she wrote the lyrics and the music. Gohar says she can't "imagine life without Gyumri" although she may leave for the capital city for university studies, she'll return to work at her beloved city. Ani Knyazyan describes Gyumri, as more like a "soul mate" while Andranik Ordinyan boisterously asks, "Why would I ever leave my city?" Walking through the streets you can't miss the over abundance of beauty salons - testament to the local women's flair for fashion and maintaining elegant attire regardless of the constantly changing weather patterns or the fact that most city streets are dusty and muddy. Even with its current financial hardships, there is no shortage of enriching artistic and cultural venues offered numerous folk and ethnic and dance ensembles, children's dance and puppet theatre, dramatic arts theatre, Ajemian Theatre and the 1935 inaugurated Alikhanyan Puppet Theatre which since 1970's has been a member of the world puppet theater organization under UNESCO. Arts education continues to be paramount here and an integral part of early education. During after school hours uniformed school children are seen rushing off to arts lessons trudging through dusty, muddy streets still under construction. At Gyumri's two-story National Center of Aesthetics , which for nearly 40 years has been under the direction of native artist, Susanna Mkrtchyan, art lessons continue to be offered with carpet weaving, embroidery, painting, Armenian folk dance lessons, sculpting and more. The center also operates a kindergarten to supplement the sparse government funds, which only cover salaries not operational costs - leaving the center dependent on private donations and funds raised from children's art exhibits. Catering to tourists visiting the city and the region's ancient landmarks are numerous cafés and restaurants. From Ponchik-Monchik (for fried dough lovers) on Vartanatz Square, to Gyumri Hatzatun (Armenian and Georgian cuisine - their mushroom, tomato and fried beef tongue dish was absolutely delicious), to a fish lovers paradise, Cherkezi Dzor picturesque fish farm/restaurant offering freshly caught and cooked fish, freshly baked bread and more. There are also countless hotels and hostels throughout Gyumri - some gaudier than others like the Alexandrapol Palace Hotel, across Holy Savior Church. The crowned entrance rises amidst earthquake ruins in faux neo-classic Italian ornate interior, painted ceilings, and a cavernous, underground restaurant. It's the ultimate in flamboyance built by a former mayor turned hotelier. No doubt the hotel's construction costs far outweigh a mayor's income level. For more authentic and classy hotel experience check into Villa Kars the city's first boutique hotel, tucked away in the historic district, off the Vartanantz Square. The superbly renovated 18th century Gyumri Art Nouveau gem, owned by Antonio Montalto, is two historic Gyumri homes resurrected to their former glory of the "Armenian Belle Époque" style. An Italian and a physician by profession, Antonio first arrived in Gyumri during the 1988 earthquake, and soon founded the Family Care Foundation NGO micro-enterprises to offer arts and ceramics lessons and a livelihood for children and adults recovering both physically and mentally from the earthquake. Today the children's ceramics studio manufactures enough items to be sold at Antonio's three boutique hotels in Yerevan (Villa Dalenda, Villa Ayghedzor) as well as Villa Kars. Rooms at Villa Kars (starting at $50/night with breakfast) offer an artistic blend of ancient and new worlds, with a décor poised to preserve Gyumri's past splendor. A beautifully landscaped, serene courtyard offers refuge for meditation to the sounds of percolating fountains. A basement floor room with exposed brick walls is where guests take their breakfast - the quaint, Zen décor is a tribute to the native son George Gurdjieff, the influential early 20th century Russian mystic, philosopher, spiritual teacher, and composer of Armenian and Greek descent. There are plans for a Gurdjieff Café at Villa Kars - a social entrepreneurship that's heartwarming and sincere to Gyumri's reputation. Another unique hotel in Gyumri is the Berlin Art Hotel - part hotel, part art gallery and exhibit space showcasing works by local artists for sale in its hallways, dining area, and even in its landscaped outdoor garden. The hotel is part of the Berlin Polyclinic for Mother and Child, which sits across the hotel's building, and funded by the German Red Cross Fund for Armenia. A post- earthquake Bauhaus architectural design structure, its energy source is provided by solar panels and guest rooms are former overnight patient rooms retrofitted as comfortable, efficient hotel rooms (at $56/per night with breakfast) showcasing works by individual Gyumri artist. The hotel's Gallery 25 has rotating exhibits of works by the students of Gyumri's Arts Academy. Across Berlin Art Hotel sits Gyumri's famed open market, one of the oldest in the country, which stretches out in miles in a maze of stalls and small make-shift stands offering everything from fresh fruits, vegetables, local string cheese, fresh and smoked fish, aromatic coffee, to housewares, custom jewelry, clothing and everything in between. Driving back from Gyumri, we choose the shores of the east banks of the majestic Akhuryan River, which with its serenely peaceful and breathtaking natural surrounding buffers a border between Armenia and Turkey. The driver swerves around large potholes on the road - and goes on to tell us about how a humorist at a beer house tells his friends of being chased by the traffic police, when he fell into a pothole. Did you get arrested, his friends ask? No, he responds, the police drove right passed me. The bigger the potholes the more times the joke is repeated. On the Turkish side of the river dwellings and a minaret rise in a distance closely monitoring the border, while on the Armenian side Russian military bases stand guard. The Turkish government prohibits Armenians to fish on the Armenian side of the river while Turks freely mug the river of its fish. Ironically the gentle waters of the Akhuryan River flow past four of the 12 historical capitals of ancient Armenia, including the medieval Armenian city of Ani - the city of "1001 churches" now in ruins near the closed Turkish-Armenian border. At least the river, which originates in Armenia, stands witness to the systematic destruction of the Armenian sites. But one thing is clear - on the Armenian side of the border Gyumri stands resilient as it has for centuries. 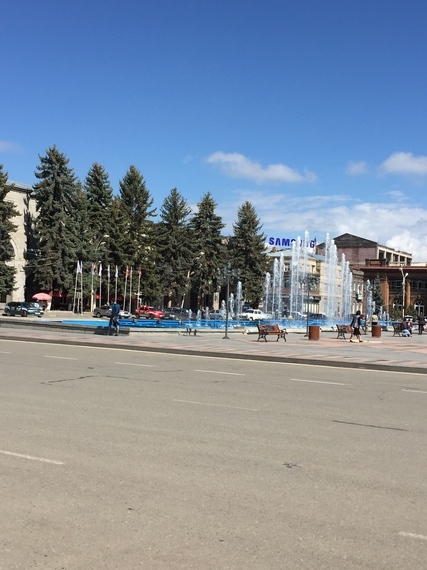 I'm reminded of the youth at the city square, especially Andranik (Ordinyan) who boldly remarked that they are the "masters" of their city, proud of its glorious past and determined to uphold the legacy that has been shared with them by their elders. This sentiment was echoed by all the youth who didn't shy away from confirming that Gyumri is the "cultural center of Armenia" and far surpasses Armenia's capital city. And with that, the historic rivalry that has played out between the two cities for centuries is sure not about to disappear- not with this generation!